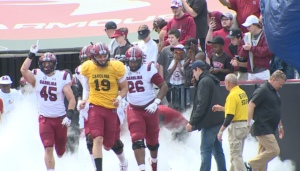 COLUMBIA, S.C. – The Garnet team rallied with two fourth quarter touchdowns to pull out a 28-16 win over Black in a see-saw affair that saw five lead changes, as the South Carolina Gamecock football team wrapped up its 2019 spring drills with the annual Garnet & Black Spring Game on Saturday afternoon. 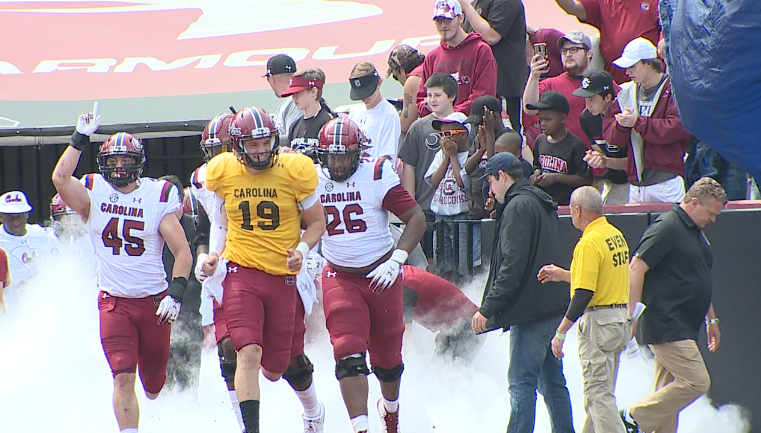 A crowd estimated at 25,832 was on hand on a beautiful Saturday afternoon in Columbia, mostly to watch two young quarterbacks duel for the number 2 role behind incumbent signal-caller Jake Bentley. Neither quarterback would disappoint, as redshirt freshman Dakereon Joyner went 10-of-23 for 185 yards with one touchdown and one interception, and added eight carries for 60 yards, while true freshman Ryan Hilinski completed 24-of-36 passes for 206 yards on the afternoon, including completions on each of his first eight attempts. In limited snaps, Bentley was 9-of-14 for 96 yards and a touchdown. Black got on the board first, scoring on its first drive of the game. With Joyner at the helm, the team covered 62 yards in 14 plays, consuming 4:54 on the clock, culminating with a Parker White 32-yard field goal. Early in the second quarter, another Joyner-led unit produced points, this time for the Garnet squad. True freshman Kevin Harris burst in from 3-yards out for the game’s first touchdown. The drive was highlighted by an 18-yard keeper from Joyner and a 25-yard pass completion to tight end Kiel Pollard on a 4th-and-10 to keep the drive alive. The score remained 7-3 as the clocked ran out in the second quarter. However, before the teams went into the locker room for intermission, redshirt junior placekicker Parker White was rewarded with a scholarship in a videoboard presentation, eliciting a roar from the crowd as he was mobbed by his teammates. The scoring picked up in the second half. Black regained the lead on its first drive of the third quarter. Bentley, in for just his second series of the afternoon, found Deebo Samuel alone in the end zone from 25-yards out in the annual “off the bench” play, to give Black a 9-7 lead, as no extra point was attempted. Garnet responded just two plays later when Joyner hooked up with Jay Urich on a short completion that saw Urich sprint down the sidelines untouched for a 62-yard score and a 14-9 advantage. Black countered with an 8-play, 65-yard scoring drive engineered by Hilinski. Mon Denson covered the final four yards to paydirt, putting Black back on top, 16-14 with four minutes remaining in the third quarter. Black had a chance to extend its lead, but was stopped on four rushing plays after having a first-and-goal situation from the seven. True freshman Derek Boykins was credited with three consecutive stops of freshman Kevin Harris to get the Garnet defense off the field and change the momentum of the game. Garnet took the lead for good when Slade Carroll burst through the line for a 25-yard score with 4:50 left in the contest, giving Garnet a 21-16 advantage. Garnet sealed the win in the waning seconds when Trey Adkins caught a 1-yard pass from Urich for the game’s final score. The versatile Urich, a quarterback by trade, completed 6-of-8 passes for 84 yards, and was also the game’s top receiver, catching nine passes for 130 yards. Linebacker Ernest Jones was the game’s top tackler with nine stops, just ahead of safeties J.T. Ibe (8) and Jamyest Williams (7). Safety Jamel Cook recorded the game’s lone turnover, intercepting a pass from Joyner in the red zone.